Get heart-and-brain-healthy canned salmon into your family’s diet with this recipe from Aviva Goldfarb of The Six O'Clock Scramble. See the full post at Kitchen Explorers. In a medium bowl, combine the salmon, mayonnaise, lemon juice, dill and onions and stir to combine. Gently mix in the peas. 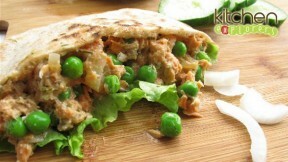 Serve it immediately stuffed inside the pita pockets (optional), or chill the salad until you are ready to serve it, up to 24 hours.